It was too good for students. I am produly says that I AM A AVITIAN. Overall verdict is that its an average college but the only problem is the weather. There are no proper restaurants near college as well. The college is located very far from Chennai city.there is no courier facility to the college campus.the college helped students during the times of floods.it also arranged choppers for students.the college works hard and ready to work more Harder for welfare if it's students. My dreams become true in all aspects with help of my college. I am over all satisfied with the college because my college made me to learn not only the subject but also the way to behave and interact. Here i am able to enhance my interpersonal skills. Though my score is not good in the semester exams but i am sure that I can get a very good job because the college made me to develop my communication skills and interaction skills which are also an important accept for getting placed. The sport events and cultural events happen quite often in our college and many students show their own interest in participation. Ever College had its pros and cons iam not pointing out about this college because I love my college. Aarupadai Veedu Institute of Technology (AVIT), Kanchipuram was established in the year 1998 as an affiliated institution under the Vinayaka mission university. Later it was affiliated to the Anna University, Chennai. 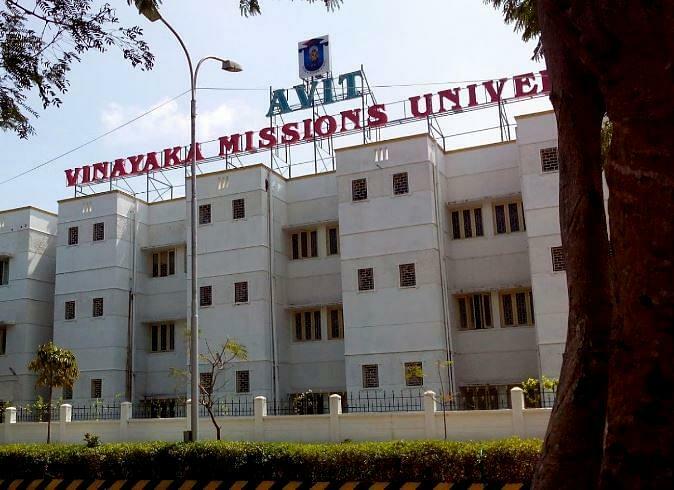 In 2004, the institution was included in the ambit of Vinayaka Missions University, Salem. The institution is committed to impart quality education to the students from different socio-economic backgrounds. The institute is ISO 9001:2008 certified. Why to Join Aarupadai Veedu Institute of Technology (AVIT), Kanchipuram? Campus: AVIT is located on Rajiv Gandhi Salai in a sprawling 49 acre campus, with a built-up area of 5.65 lakh sq. ft.
Infrastructure: The Institution has separate hostel facilities and playgrounds. An ambulance facility is also available round the clock. An ATM Centre is established in the campus through ICICI Bank. The campus is provided with broadband Wi-Fi connectivity enabling the students to access the internet 24 X 7. Placement assistance: AVIT has an exclusive Career Development & Placement Cell devoted to cater to the training needs and placements of the students, headed by Dean - Career Development. The C D C at AVIT has a clear understanding of the significance of the values of training and placement and works constantly towards achieving the goal by keeping in view of the ambition of the institute as well as students. Apart from training and placement activities, the CDC also teams up with industries to build up industry-institute interaction. Student friendly: There is scholarship for deserving candidates and free coaching for GMAT, TOEFL and other exams. "My dreams become true in all aspects with help of my college." The college will took students by secondary board marks and the college didn't have any sort of entrance exam and the minimum percentage to get a seat in the college is 80% and college will also accept some donation or payment seats.There is a formal interview after completing the counseling.I opted civil because I am interested in buildings. "Good for low budget students"
When I entered in this college there is no entrance exam directly I joined in this college but now they are conducting entrance exam. I didn't have to write any exam. I just approached the college management and I was offered a seat based on merit, with scholarship.